He’s called “Mr. Brilliant,” for good reason. Some time back John F. Ptak faced A Very Large Medical Issue. Very. Large. Grand Offers of Help from so many people?” Something I am facing and, by extension, David is facing these days. On his own David’s attitude is very straight forward. David is grateful and he is practical. I say “How? How can I ask or accept all this help?” and he says, “Just say thank you.” John’s instructions had a resonant ring to them. In the conversation John first and last acknowledged two important things. It took him a bit of time to come to terms with the “I can/should do this all on my own,” mentality with which our generation was raised and most everything he learned about being able to accept the Gift of Help he learned from Patti Digh and Amy McCracken. Noted. Here are the notes I took on this very helpful conversation...If there are quotes around it it’s as close as I could capture to what he actually said. Otherwise it’s commentary on what he shared. “The whole thing of being able to accept offers of help is pretty simple. Maybe even easy (although it took me a while to grasp this and come to grips with really how simple it is). Do you know what you need? Ask for it. Does someone give you something? Accept it and say thank you. In the context of need, that’s pretty much it. You’ll busy yourself thinking, and I thought of this a lot, HOW can I possibly pay back these big kinds of favors. Forget pay back. It’s not about paying back. It’s about paying it forward. “Once you get past all the issues and thinking about it. Once you get past all THAT, you realize that with people helping you, you’ll be better able to help others. You’ll be able to help more and do more. “I know we’ve all been raised to do things on our own. Stand up. Do it all. There are times that with that attitude you can lose everything: drown. Go down with the ship. You’ll be under water but at least you’ll have your pride? No. Part of the deal of a gift is that you have to accept it. “When people ask you what they can do to help - specificity is your gift to them. They WANT to help you, it would make them feel good to help you and if you have nothing specific for them to do you are going to end up with a freezer full of potato casseroles. I remarked that in a weird way, not identifying the ways I could really use help in this period of challenge, is kind of selfish. Like it’s okay for me to help others but it’s not okay for people to help me. As I said that I also heard the arrogance of it. Feeling resistance to help is being prideful about my own need. I was in conversation with two academic who deal in leadership issues. Just today it was topical as to how important it is for a leader who is overwhelmed to be able to say, “I cannot do all of this myself, I have to delegate some things or set some things down.” There’s a clear grace and humility involved in being able to receive help. Or ask for what you need. Ironically I am a strong advocate of asking for what is needed. It’s theoretical. I feel pride in the small asks,or asking for support in ways that help others in addition to me, but the big asks push me into a wobble. John agreed that in a kind of twist on the script, refusing to specifically ask for helpis kind of selfish. It makes the person who wants to help you feel uncertain...and then, all those potato casseroles. “Look just ask. Ask for what you need. And then, when you get it, say thank you. There’s no next thing. There’s no pay back. You don’t have to go solve some world crisis or invent the next vaccine to pay people back. You just go on better able to do what it is that you do and you help others when you can. “So, start a list and look at a calendar. Identify specific times that you’ll need help. These notes brought to you by someone who is practicing specificity and acceptance. They helped me, A LOT. Perhaps they’ll help you or someone you know who is in the same situation. I have been receiving so many gifts, lately. Friends are being helpful as I anticipate major surgery (brain surgery) for my husband. My birthday's coming along. And, because I have such generous friends, I get gifts for no particular reason at all. I looked around last evening as I was busy being enchanted with three vintage wobble dolls (I've been writing a lot on social media about "the wobble" you can find me on Facebook maryanneradmacher10). Wanting to have these wobble gifts front and center in my work environment led to an unexpected activity last evening. I removed everything from the curio shelves in my writing room. I dusted the shelves. I parsed out the materials asking,"Is this still relevant to the work I am doing now?" and if there answer was no, I asked, "Do I know someone who might find value in this piece?" If the answer was no...(and the answer was 'no," quite a bit) it is a sweet little something that is heading to our local thrift shop a little later today. Now the shelves hold gifts and reminders of people who are in my circle. Now. Who are doing good work with me in the world. Now. The shelves are not reminders of what was, but rather what is. Because I am increasingly aware that what captures my attention a little soon captures my attention a lot. Even a very important reminder that I made for a calendar years ago is getting passed along. The sentiment stays with me. 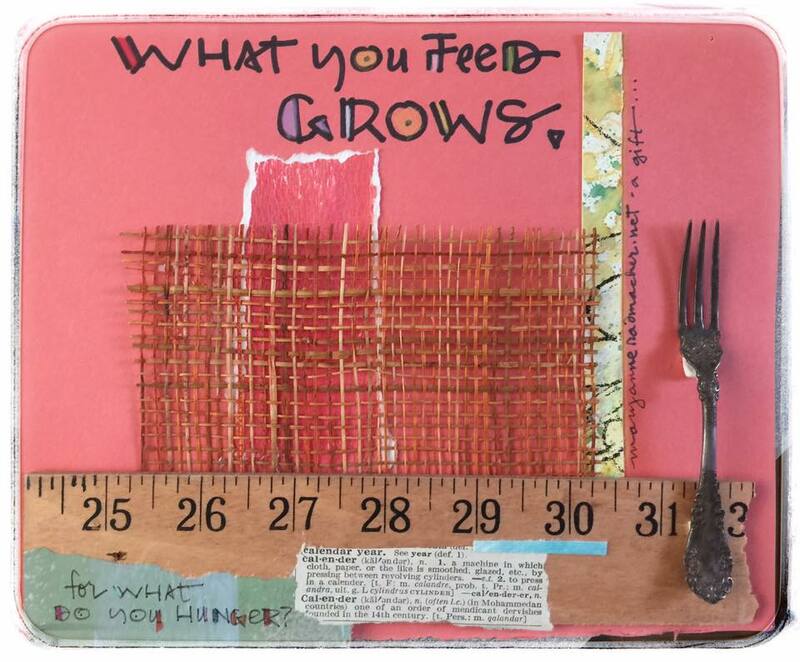 "What you feed - grows. For WHAT do you hunger?" It has a fork that belonging to a great grandmother of mine and a dictionary bit defining "Calendar." How I spend my time is a true reflection of my hunger...what I really want. So, I'm noticing that in bigger and more practical ways these days. You? I'm just going to say it. Bigger is not always better. Sometimes small is elegant and productive and spiritually rewarding. I get helpful suggestions from inventive and imaginative peoplel all the time. "Here's how you could make more money." "Here's an idea that might work for you." "You could scale that production model and increase your income by _______________%." All well intended. In many cases, correct. And. Not. Where. I'm. Standing Right Now. I spent over 21 years with no less than one employee and, at one point, over twenty. I started at my kitchen table. I've built an 8000 square foot production facility. All and everything has conspired to inform who I am today. Many of those suggestions come to me because peoplel would like me to have the ease of wealth, the choice and option that lots of money provides. Because my friend and Publisher of MABEL MAG asked me to consider writing about money - I've been giving it a lot of thought. I've been surprised to discover something about myself. I thought money was a real motivator for me. In the process of considering writing about money (which I did not do, by the way) I realize it is the capacity to fulfill my promises and obligations that drives me to earn money, the ability to respond to freinds and causes that need to oil of money to move forward, not the money itself. My prayer as a high school student was not, "God, I want to grow up and be a wealthy entreprenuer." I prayed, "I want to be an artist. I want my words to inspire myself and others." Without the measurement of money or bank accounts or return on investment ...I've been a success at my dream since the moment I started praying that prayer. "You're kidding. It takes you HOW long to make each one of those?" Yes. I get asked that a lot. My monthly bundles consume a remarkably large portion of my month. They are limited in their distribution. They sell far below their retail value. AND they do everything that I love about my work. Keeps me constantly creating and looking for new ways to articulate my impulse to MAKE things that have meaning and value. It brings a dependanble and predictable financial structure to the unpredictable nature of being an author and earing my living by virtue of royalty payments. It connects me directly with people who are using my art and words to inspire themselves and others, via gifts. It becomes fertile soil for teaching others about making things, offering designs to my awesome license partners at Applied Insight. And the folks at Quotable, and my publishing partners at SimpleTruths, Conari, Viva Editions and Brushdance. They now do what I used to have to do myself. I get to do for them what I do best: make things. Not supervise employees, fill out forms, scrutinize P & L's or scrutinze the folks who are scrutinizing the P& L's! I am fortunate that the things I would do if I were a full time corporate trainer as my "hobby" are actually what I do as my full time job. Has it happened to you? You've created something for the sheer joy of it and your friends adore it and immediately validate their admiration in this way, "You could make those and sell them." There IS a certain validation that occurs when something one makes is successful in the marketplace. And for those in the industry, that kind of success is indeed essential for sustaining the model of a business. I was in my teens when I started making gifts for my friends instead of buying them. Over the decades I've learned from my friends that still the most meaningful gifts they receive from me are those that I make for them. When I started my company at my kitchen table I couldn't have predicted the path it would take and the various levels of international distribution I would attain. And now, that model is before my license holder, Dr. Deanna Davis. An author herself and trainer, she is harnessing her broad spectrum of gifts and taking the challenge of managing changing market place realities and shifting consumer trends. And me? I'm at what is, essentially, a larger than ever, kitchen table. Making things that bring me joy and relishing the capacity to say, "Here, I made this for you." What would it be like if all the seconds, minutes and moments that are taken up with wishing and regrets were instead seized for leaning forward into your life? How would a day change? Instead of that musing over coffee over the longing you have to start the next creative project...you might, instead, start it. I love to say "start starting." The START is one of the hardest parts. It's easier to live with an idea in your head and complain that you haven't the time to realize it. And yet...when those musing moments are seized and put to work in practical ways...suddenly a dream has wings and it begins its flight to realization. Where to begin? Really, ANY where. A step forward toward that longing is a better use of your precious seconds than the time spent wishing you wold take that step. Do You Get A Choice? Yes. I know I get choices. You get all kinds of choices. What holiday(s) you celebrate. And how. And when. Really. The various faith and season based celebrations can deliver themselves with all kinds of obligations. You get to CHOOSE if you pick up those obligations. Or not. Christmas had become a very stressful day in my household. My husband gives gifts when he finds them or makes them. He does not enjoy begin told by a calendar or anyone else when he SHOULD deliver a gift. It is against his nature. Now that I know what a holiday is like sharing a home with a person whose nature is repulsed by required and imposed traditions...I made a shift. I am celebrating my gift giving quietly. I am opening my presents from friends when they arrive. There isn't a shred of evidence in our home that the Christmas season is upon us. There IS a lighting of the eight nights of Chanukkah. That works well. We focus approximately 18 minutes before dark on the light we want to bring to the world and we light the candles. We like it so much we might continue after the eight nights are through. WE choose. At first I thought it would be difficult to give up the festooning and festivities associated with Christmas. I learned our temporary neighbors (here for a a family medical emergency) had not one holiday decoration. VIOLA! My collection of sweet holiday decorations found purchase in the soil of a neighbor's need. They are happlily pressed into service and will be returned after ephinany to be stored another year. I don't know if our home will be decorated for Christmas next year. We'll choose. Then. For now, I embrace that I have a choice in how I articulate the celebrations of the season. And I am grateful to be in a stress-free home. Where we pave our own kinds of traditions. One. Day. At. A. Time. 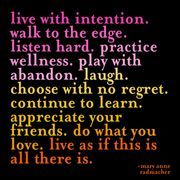 Mary Anne Radmacher updated her status. "How do you set up a writing area that is effective? The answer to that is a different as the person asking it. I can tell you about my process and you can find the things that are resonant for you. First, from my formal consulting days: your IMMEDIATE WORK ARC is that semi circle right in front of you. If you hold your elbows to your rib cages and reach them in a half circle, that area should be clear of everything except your writing tools. Keyboard, pen and paper, recording device. the SECONDARY WORK ARC is the semi circle you create by extending your arms and drawing an imaginary half circle. Within this easy reach should be the other tools you require for your writing. Favorite pens. Timer. Notepapers. In mine is my timer, my hourglass, some inspiring icons, a calculator and my "stick to it" writing system papers. This arc applies whether you are working on your sofa, at a coffee shop, or an established station in your home or office. If you find yourself working ON TOP of piles or in between stacks of other projects, those things become the entity on your shoulder that Virgina Wolfe writes about. They are screaming for your attention and even if you do not tend them they are completing for your focus. Chaos can swirl around. Piles can be ceiling high...just NOT in these two work arcs. Just like Charles Schultz found he created the best cartoons in his dependable working environment, which he kept the same for years, so do I find greater output when I maintain these physical structures. I hope this experience relates in some way to your writing experience.